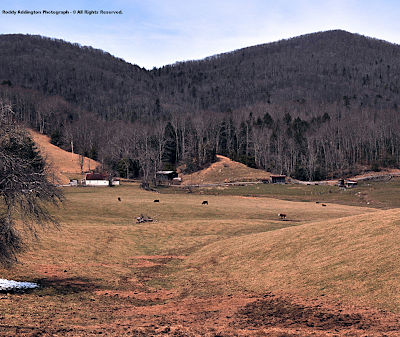 The High Knob Landform: March 2010: Second Week - Spring Prelude! ready to handle gorgeous, breathtaking photography! Pristine whitewater tumbling over the truly awesome and spectacular Big Falls of Little Stony Gorge marked the beginning of a much cooler weekend on March 13 of the year 2010. A general 0.50" to 1.00" of rainfall was light compared to what could have accumulated across Little Stony Basin with this latest storm system, which spread drenching thunderstorm rains and hail across portions of Lee County, Virginia. over and along Cumberland Gap National Historical Park. 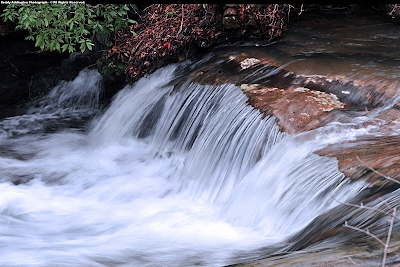 With recent snow melt, and some snow still lying across highest elevations, rainfall was more than enough to get whitewater rolling out of the High Knob Massif. Note: If the above map begins to "wobble" around just click anywhere within the green to regain control, or use the arrows in upper left corner to move it around. Zoom in and out signs are also present. The above map, courtesy of Google, is part of my current map project for website improvement. Click on the BLUE placemarks above to read about specific locations, or view the entire landform map by clicking on the embedded link at the bottom ( when done, simply hit your return arrow to come back to my main website ). 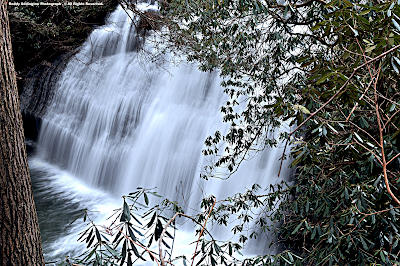 While these waterfalls are simply stunning during any time of year, especially amid good flow volumes, they form but one aspect of wonderful Little Stony Basin. 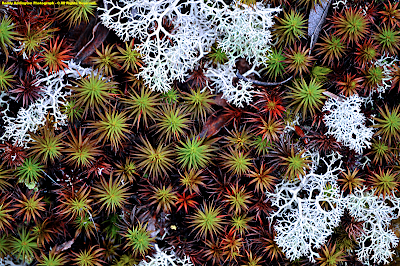 ( Bryophytes ) as well as various other resilient plants and fungi ( including lichens which are a composite of symbiotic organisms ) are adding color to the early spring woodlands of lower and middle elevations emerging from a prolonged covering of snow. 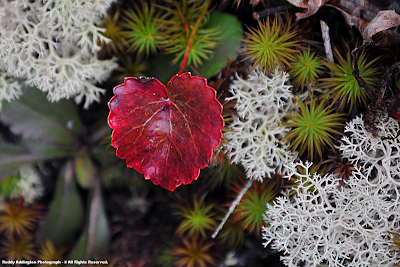 The colorful scene above being dominated by the red leaf of Galax ( Galax urceolata ), Haircap Moss, and a species of Reindeer lichen ( Cladina sp. ). 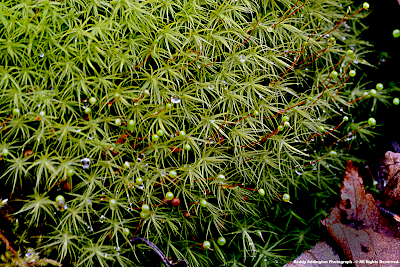 Water is an ever present factor in supporting this wondrous array of life forms, with fog drip and rime deposition from trees adding moisture to those locations with naturally droughty soils. 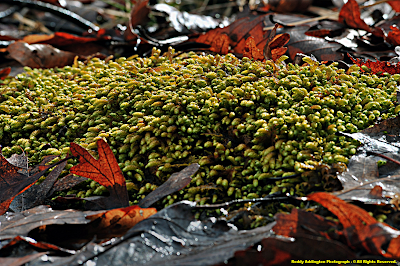 An explosion of wildflowers and ferns will join bryophytes, fungi, and many other floral species in coming weeks and months as the mountain forests return to life from the bottom upward! 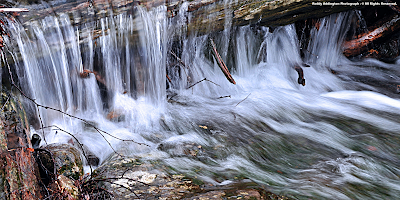 In rhythms and cycles, life begins upon the forest floor and expands upward with time to the tree tops, much as rebirth and renewal starts in lower elevations and spreads upward in time to cover the great expanse of the high country domain of the massif itself ( all being connected ). I would like to thank Thomas Wieboldt, curator of plants at Virginia Tech's Massey Herbarium, for idenitification of the above species. 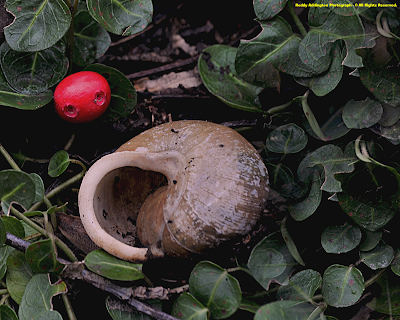 Tom is also site administrator for the simply wonderful Digital Atlas of the Virginia Flora to which The High Knob Landform has been linked. 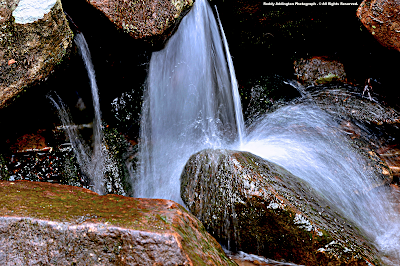 Shimmering like pure gold a colorful mixture of minerals, lichens, and water interact with rays of light passing in front of the camera lens of my gifted friend & photographer Roddy Addington to paint more breathtaking scenes within awesome Roaring Branch Gorge. Roaring Branch Gorge has an amazing presentation on satellite imagery, and mapping, with a V-shaped chasm that is most interestingly pointed opposite in direction to that of the much larger, inverted V-shape of adjoining Powell Valley. 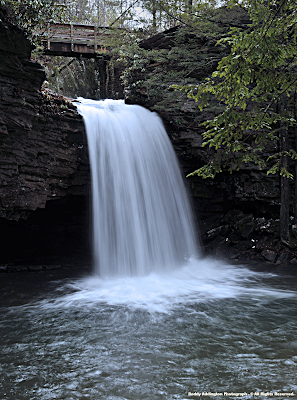 Roaring Branch Gorge has been greatly impacted by adverse weather conditions this winter. 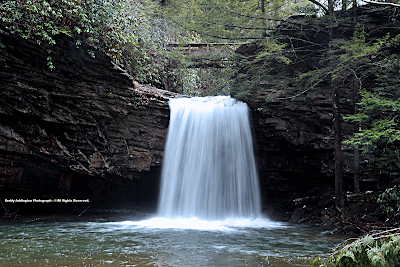 The Clinch Coalition is planning a trail work day this Saturday, March 20. For more information about how you can help, please contact their website: The Clinch Coalition . As mapping above so clearly shows, Roaring Branch Gorge has formed within the exact same arm of mountain that extends southwestward from the High Knob Massif, and Powell Valley Overlook, as Little Stone Mountain. The only difference, its on the southwestern side of "The Big Stone Gap" water level break in the mountain arm! Like the water above, how could this not be clearly seen and understood as the exact same mountain flank which runs southwest from the High Knob Massif to Cumberland Gap National Historical Park? ( and its verified by geology ). I did not choose to name this truly spectacular landform "The High Knob Landform," as the name High Knob was already given to the peak capping its expansive mass of highcountry long before I was born ( or my folks were born ). If it had been named Curly, Larry, Moe, or Shemp, to make a most important point, I would be calling it "The Curly Landform," or which ever infamous brother it was named after! This is, in fact, so plain that with an NJ 17-10 Raised Relief Map, even a person blind-folded can trace the mountain flanks of this great landform so plainly with their own fingers as to feel that its all connected! ( its structural framework ). Because when combining many major natural sciences together it also becomes clear that this landform is more than a geologic structure. Reference The High Knob Landform link at and scroll through the many attributes down to my author's comment section to get a basis for this fact. Because the mass of high terrain surrounding the peak of High Knob is the last remaining remnant of what the entire Powell Valley Anticline used to be like ( one consolidated mountain before its great calcareous core was breached by erosion and opened up to reveal the valleys of today ) at a previous important point in geologic time. that any give state merely represents a point in time. This fact was illustrated many decades ago, in such maps as drawn below by now famous geologist Charles Butts in 1927. Matching rock stratas were connected above Lee County, Va., from near Cumberland Mountain to Wallen Ridge. Note that if all the layers were connected, this great arch of mountain would extend even higher and reach from Cumberland Mountain to the Powell Mountain-Newman Ridge area ( not an absolute match today, since over time there were different rates of erosion between the NW and SE flanks of this great landform ). The very old map above illustrating, still to this very day, how most all of Lee County, Va., was once INSIDE of a great consolidated mass of mountain. An incredible fact! 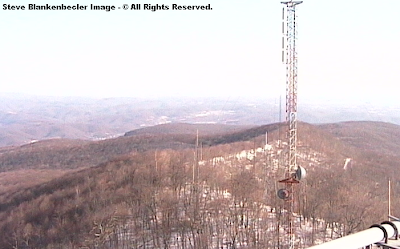 The only complete remnant left today is the sprawling expanse of high country surrounding the High Knob peak. Its the only portion of this ancient mountain which still connects both NW & SE flanks together, and is therefore the given ( non-geological ) name for this great landform ( i.e., I did not give it the name "High Knob." It was already given long before me. I merely recognized it as being much more than just a mountain peak ). If you will study USGS geology maps for the Wise-Fort Blackmore and Coeburn quadrangles, you will see that the mass of High Knob spans BOTH limbs of the Powell Valley Anticline. In no other place within the Powell Valley Anticline does a mountain join both sides of this great Anticline together. The separation between the two limbs ( NW & SE flanks ) of the Powell Valley Anticline begins at the apex of Powell Valley in Wise County, Va., and only from there becomes increasingly wide with increasing distance to the southwest. From a formation perspective, it actually ends at the majestic apex of Powell Valley in Wise County, as noted below, via a long process of headward erosion over time. In other words, from the head of Powell Valley eastward across the High Knob Massif to Guest River Gorge there is still a mass of mountain left standing which joins both sides of the anticline ( although much lower than ancient times ). From the head of Powell Valley, in Wise County, Va., there begins a great erosional breach which opens the landform up into distinct NW and SE flanks separated by an increasingly wide valley toward the southwest ( as denoted by Charles Butts in his 1927 drawing across Lee County ). To be more precise, this great breachment of the Powell Valley Anticline is likely a process of headward erosion in which the inverted V-shaped Powell Valley of Wise County now marks its northeastern-most terminus as the great mountain mass opened up over time from southwest to northeast. A person looking from Powell Valley Overlook, along U.S. 23 just outside the City of Norton, may see a valley that becomes wider with distance but, in reality, is actually standing at the end of a spectacular erosional process which exposed the calcareous heart of the great High Knob Landform. So if a name is sought to describe this landform in terms other than geology, and its last consolidated remnant is named High Knob, should not the landform be called "The High Knob Landform." That is the ONLY reason this website is named The High Knob Landform, since its supported scientifically and clear to anyone willing to see ( the name has nothing to do with environmental agendas, and did not arise via any group, it simply is the facts and reality of what is ). Local names have created confusion over the years. 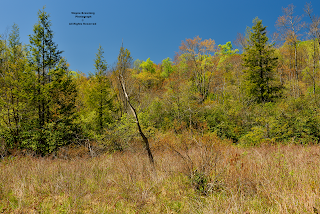 While many mountain ridges comprise the High Knob Massif it is absolutely clear when looking at them from above ( per satellite imagery and terrain mapping ) that they all are connected together as one solid, expansive mass. do others within written works, so that it is not just my viewpoint. I have merely tried to better define and highlight what this massif contains, and why "High Knob Massif" is the best terminology to recognize this unique mass of remnant high country. The same also applies, for example, to the northwestern mountain arm of this landform. Little Stone Mountain, Stone Mountain, and Cumberland Mountain are all named locally, but again are clearly all the same continuous running mountain ( broken only by a few water level and wind gaps ). The fact that the above mountain ridges are all the SAME was recognized by now famous geologist John Rich, way back in 1933, when he created the following map ( as one example ) labeling all three mountains as Cumberland Mountain. This website is not asking that all these local names be changed, but merely that they all be recognized as being part of this same, great landform which I call The High Knob Landform. It is time to wake up and smell the roses of the real facts since this is a great landform of truly vast significance, regardless of whether one calls it the High Knob Landform or sticks by only the pure geologic term of Powell Valley Anticline. 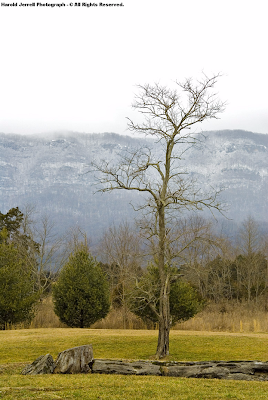 A landform in which The Cedars of Lee County, for example, are as connected to the remnant massif of High Knob as they are to any other portion of this landform ( even more so, as later DNA based genetic research featured on this website will reveal ). how could this be made more clear! Finally, it is very important for everyone visiting this website to understand that it pushes no agendas for no groups, be them local, state, federal, or otherwise! The purpose of this website is simply to present and illustrate WHAT IS, based upon scientific facts ( some of which certainly comes from my personal & original research over 27+ years ). of all those impacted by it ( be them permanent residents, visitors, or in any other way associated with this awesome landform ). This is often done using many high quality, gorgeous photographs, freely submitted by the photographers who themselves have no agendas to push other than their pure and simple love for the world around them. I owe them all an enormous debt, as they are very talented and wonderful people who clearly are making a positive difference in the world around each of us privileged to view their works! 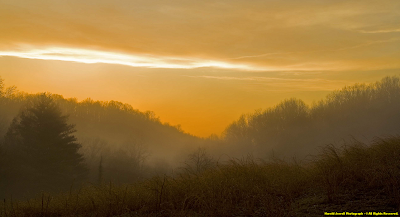 My friend Harold Jerrell took this simply awesome sunrise, above his home in Lee County, Va., early on March 12. 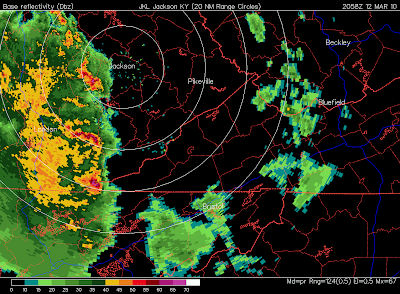 Note the high reflectivity echoes over Cumberland Gap National Historical Park, along the VA-KY border of western Lee County. This thunderstorm, and several others, were associated with hail and heavy rain. Large white areas visible along the main crestline above, being locations of lines of deep drifts formed over time by snow and blowing snow. Despite booming spring-like thundertorms, widespread snow continued to blanket northern slopes of the High Knob Massif. 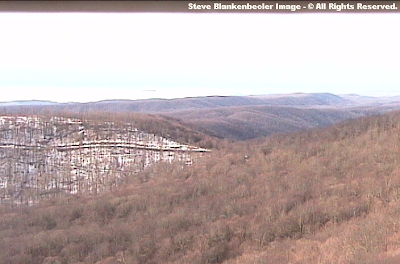 The above view illustrates snow along the lofty divide separating Benges Branch, Lost Creek, and Clear Creek basins ( looking past the Blue Ridge PBS Transmitter Tower ). Once again it is possible, even at this long distance, to see areas of deep snow drifts along upper slopes of Little Mountain Knob ( 4067 Feet ) and the High Knob Lake Basin. Large piles of snow are visible in the above view along scenic State Route 619, between High Knob and Camp Rock, as it passes along Little Mountain Knob in the head of High Knob Lake Basin. Lofty ridges of majestic Big Cherry Basin are also visible beyond the high wind gap above, where lingering snow is more difficult to see amid steep, mountain forests. 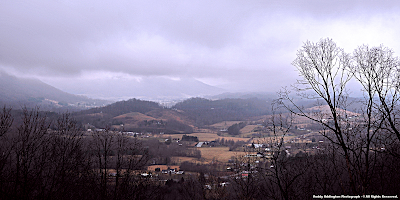 Thunderstorms were part of the same system which generated the whitewater scenes above, and this cold, dark, and damp view from Powell Valley during March 14. These nasty conditions continued through March 15, complete with enough snow to whiten highest elevations of the High Knob Massif into Sunday, Monday, and Tuesday mornings ( March 14-16 ). As this season always is amid the Appalachians, there will be up & down swings like this during the entire March, April, and May interval which defines meteorological spring. 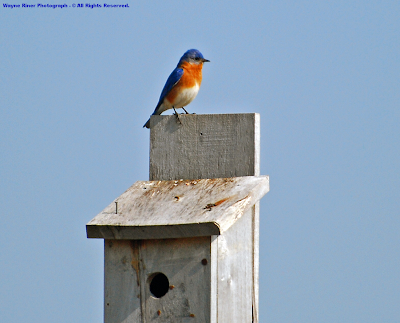 "Even though a trace of snow lingered here and there on the ground, bluebirds surveyed the nesting boxes. They sat on top of their potential nesting homes against the blue sky and sang to celebrate another coming season." 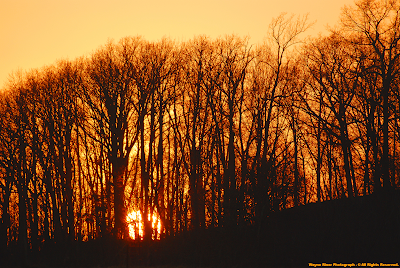 "The day was at the end of a long and cold winter, and this one allowed us to stand in the warm sunshine. Also, it was a day when the sky was blue and cloudless, and a day when bluebirds sat on their nest boxes and dreamed of warmer days." We all hope for more Bluebird ( Sialia sialis ) days like so well documented by my friend and talented photographer Wayne Riner, atop majestic Long Ridge of the Tennessee Valley Divide! 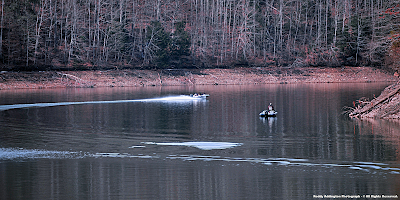 John W. Flannagan is a majestic lake sitting in the northeast part of Dickenson County, amid the river confluence of the Pound and Cranes Nest valleys ( near the axis of the Middlesboro Syncline of the Cumberland Mountain Overthrust Block ). Like beautiful North Fork of Pound Lake, John Flannagan is a U.S. Corps of Engineers reservoir. 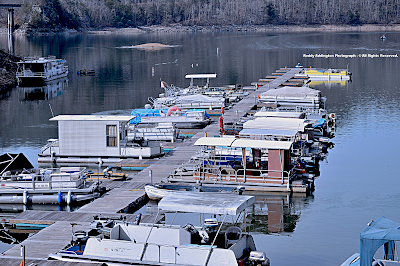 Constructed in 1964, the lake contains 1145 acres of water and possesses an undulating shoreline of nearly 40 miles. 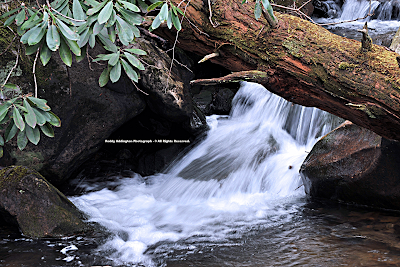 It catches run-off from 221 square miles of mountainous terrain draining Dickenson and parts of northern Wise counties, in the Russell Fork Basin. 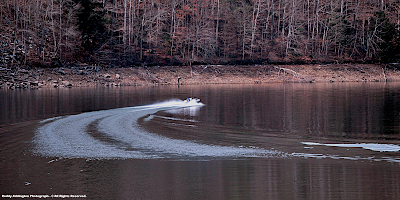 At full summer pool, John Flannagan Lake has a water level elevation of 1396 feet ( 2827 feet lower than the peak of High Knob ). 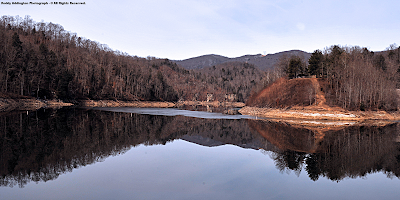 At winter pool of 1384 feet above sea level the Flannagan is ready to store water in order to reduce downstream flooding along the Big Sandy River and Ohio River. John Flannagan is the main control point for annual whitewater releases into Breaks Gorge, during each weekend in October, as part of the winter drawdown of water from its Dam. For some reason the above photograph, upon first glance, made me think of the big hit song by Country Music artist Craig Morgan, called the "Red Neck Yacht Club." No offense, of course, to any of my "kin" folk who have a boat tied down!! 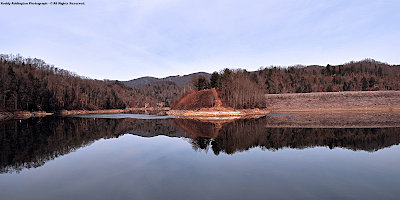 Both John Flannagan & North Fork of Pound reservoirs rest adjacent to majestic Pine Mountain, whose rugged crestline extends 120 air miles from Breaks Interstate Park to the Clear Fork Valley near Jellico, Tennessee. 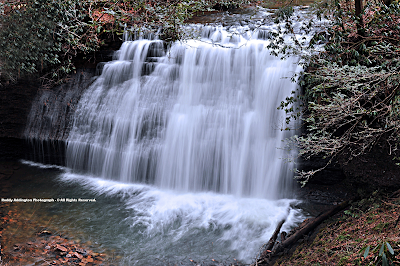 For many years, and to this day by some, Pine Mountain was called Cumberland Mountain, with the portion in Dickenson County being known far and wide as "South of the Mountain." I met one my favorite people in the world due to this issue, the late Wright Carter of Clintwood, who was interested in finding out why Pine Mountain was NOT Cumberland Mountain. I always find the above most fascinating, since the only other major anticline within the Cumberland Mountain Overthrust Block apart from the Powell Valley Anticline of the High Knob Landform is called the Pine Mountain Anticline. Again, prior to satellite and detailed terrain mapping, the confusion came about as many folks thought that the mountain running southwest from Breaks Interstate Park was the same mountain which held the famous Cumberland Gap. ( Coal Basin ) lying north and northwest of the High Knob Landform. This is illustrated nicely by a graphic presented at the September 2003 Annual Field Conference of the Kentucky Society of Professional Geologists. 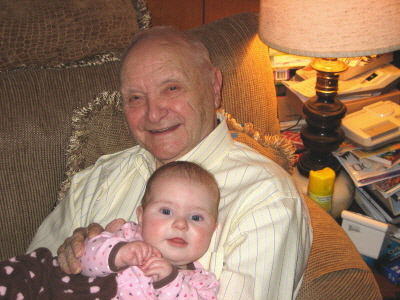 Finally, I would like to dedicate this update to one of the best men I ever knew who passed from this world last week. [ I think Leonard would like all the information I put into this update about geology, the mountains, and other things ]. It was nothing but a privilege to know and talk with Leonard, who attended presentations I gave years ago to Historical Societies of Clintwood & Pound. That's when we first met. I would see him occasionally in Clintwood over the years and he always was very interested in mountains, weather, and many other things of the natural world. Leonard was such an intelligent, kind, and thoughtful man. He was also a notable writer & gifted historian! He later gave me an article that he intially wrote for Mountain People & Places, which was submitted to the Dickenson Star newspaper for publication, about the great snow of March 1942. He sent me this to use in the Climatology section of my book about this great mountain region. I would like to reproduce it, written in his words, to illustrate what a talented writer, historian, and man he truly was! "Where are the snows of yester year?," lamented the poet Francois Villon as he looked over the city of Paris during a wimpy winter in the fifteenth century. It doesn't seem quiet that long ago since we've seen a snow worthy of the name, but school children, snow buffs, and we retirees who no longer have to shuffle off to "the old grind" are, and have been waiting, and waiting, and waiting. In these later years I suppose we would have to go back to the unlikely date of April 6, 1987 to record a snowfall of any appreciable depth. Sunday, February 28, 1942 dawned a brisk, sunny day, much like those we've seen during these latter days of February 1992. Over on the next ridge from our farm, Aunt Jennie Fleming had died the day before. Since there was little more than a sled road to their farm, the word came for every able-bodied man and boy in the area to help carry her, in her home-made coffin, out to South of the Mountain Road. A dozen or so of us reported at Uncle John's house about noon. As the first six men carried her coffin through the yard and out the paling gate, he sobbed uncontrollably. His wife and companion of over fifty years were gone and he was left alone. Uncle John followed us, mourning, as we divided crews and "spelled" each other every hundred yards or so out the ridge for the mile to the "main" road. There we loaded the coffin on a flat-bed log truck to be taken to Mill Creek ( of Pound ) where the funeral would be conducted the next day. The truck was driven by Aunt Jennie's grandson, Wintford Collins, who would years later ( after World War II ) become my brother-in-law. After placing the coffin on the truck, those of us from Haddonfield community climbed aboard. When we arrived at my Grandmother Lydia Soward's home near the road, Uncle John told Wint to stop. He wanted Ma ( as we called her ) to see her friend for the last time. She walked slowly from the house, through the chipyard where my uncles chopped wood, wringing her hands, tears streaming down her face. Someone pried open the lid to the coffin and tilted it so Ma could see Aunt Jennie's face. They had been friends for forty years. She looked for a long moment in anguish and disbelief, then turned and dried her eyes on her apron as she walked slowly back through the chipyard. That's the way it was fifty years ago. You did what had to be done in the best way you knew how. What does all this have to do with snow? Patience! Dignity! Forgetting, if we can, the sadness of the day, a day like that back then weatherwise was known as a "weather breeder." 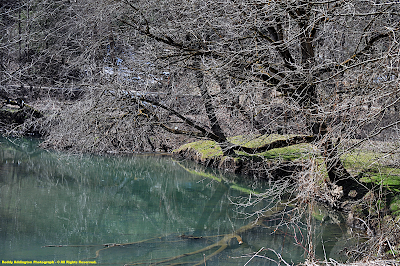 Unlike the calm winters of the last few years ( late 1980s-early 1990s ), in which we've seen several days in succession of almost April in February, a mild day in the old winters usually meant a change. Having no radio, and of course no TV, we had no way of knowing anything about the weather systems, good or bad, that loomed over The Cumberlands and beyond. While doing my chores near dark that evening ( February 28, 1942 ), I noticed a dark cloud mass just edging above the entire length of the western horizon. At bedtime, which was seldom after nine o'clock, no radio or TV remember, a deep but not oppressive chill had settled in, and the clouds had moved up to the zenith. Monday, March 1, 1942: Over the years since I have often wished that I could have tuned in on a TV weather report of that morning and seen the spawning configuration of weather systems fueled by thousands of square miles of Gulf moisture colliding with a mild Alberta clipper somewhere out over the Tennessee Valley. When I left home on my nearly three mile trek down Bad Creek and up Pound River to Christopher Gist High School, no busses were running back then, the ground was frozen, but it wasn't terribly cold, just a heavy, moisture-laden chill in the air, and the "clouds hung oppressively low in the heavens." Not as in Emerson's Snowstorm, "Announced by all the trumpets of the sky, arrives the snow, and driving o'er the fields seems nowhere to alight. It came in on little cat's feet," but rather as huge random flakes floating daintily out of a gray, laden sky. Then the heavens opened up. 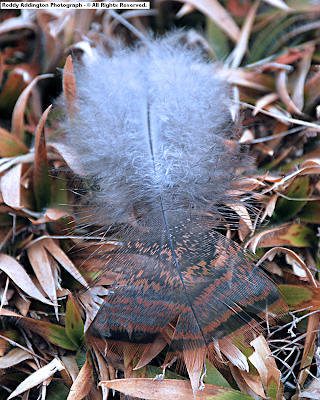 Snow came on inexorably in great sheets with "dabs" the size of white Leghorn feathers or Walking Liberty half-dollars. By the time I had bounded down the bluff at the end of Rough Ridge and reached Bad Creek, the ground was white. Up the old narrow gauge railroad bed alongside Pound River, the heavy, wet snow bent the laurel branches over the trail, and I had to plow my way through. Every few minutes my cap would become heavy with snow and I would have to shake it off and brush the build-up off my shoulders. When I reached Pound the snow was "shoe-mouth" deep. In those years, school closings were left to the discretion of the principal, or to the teachers in the one-room schools. On this Monday morning, March 1, 1942, Mr. O.M. Morris, principal of Christopher Gist High School, thought that snow or no snow education was to be the primary consideration, as it always was. Like the rest of us, unarmed with a weather report, to him this inexorable escalation of snow was nothing but a typical March aberration that would clear by noontime. We ate our lunches, no cafeteria back then, in our home room. Through the furiously falling sheets of snow, less than a hundred yards away, the town of Pound could hardly be seen. Finally, about 1:30 o'clock ( 1:30 PM ), Mr. Morris emerged from his office and by whatever barometer, mercifully decided that this snowstorm was for real. The snow was now 14 inches deep. Whether first graders or seniors, we were all on our own, if we walked to our homes in town or five miles to the head of Bold Camp. I've often wondered how the little primary children, dressed as they were in light clothing and thin cotton stockings, ever made it to their homes. By a merciful providence, over in town, I caught a ride toward home with my older brother Denver, who just happened to be coming in from his business in Abingdon. 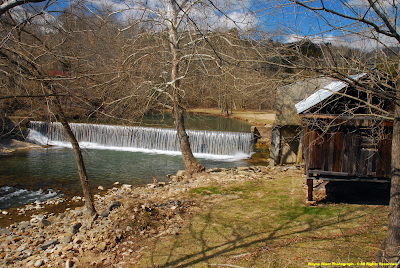 In retrospect, I've often wondered if I had tried to walk home that afternoon by the river route, with three footlogs over Bad Creek and the steep terrain, whether I would have made it. In a previous sentence you may have noticed that I caught a ride "toward" home with my brother. He had a fancy, yellow 1939 LaSalle coup, next to the Cadillac in the GM line and long ago discontinued, with a characteristic pinched grill. To its credit, we made it up Horse Gap Hill, out through Mud Hole and a mile down South of the Mountain Road. But when we headed up the long incline to Haddonfield, we were pushing snow up front. Finally, above Pine Tree Hollow, the LaSalle stalled. Denver left it there in the middle of the road. Nobody was going anywhere, anyway. We lit out in the snow, plunging wildly toward home. I thought as we struggled through the snow, that they were burying Aunt Jennie about this time. On my five foot, six-inch frame the snow was "straddle deep." At home the "pile-up" continued, with little wind, no drifting and no abatement. It seemed that there was a literal molting of the heavens! Chores were hurriedly done and "in tumultuous privacy of storm," the family settled in for the night. Tuesday, March 2, 1942 dawned to an unread world. 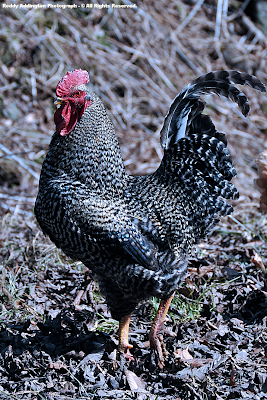 The familiar and comfortable landscape surrounding the homestead was strangely altered. Where fence posts, railings, shrubs, and outbuildings once stood, either there was nothing, or the storm had mockingly left a scarcely visible snow-capped remnant above the altered landscape. That morning my brothers and I had to dig a canal to the barn to feed & water Ol' Jim and Brownie, our mules. We turned them out of their stalls to go to the barn spring on their own. It was hilarious to watch them cat-lope through the mountainous snow. Denver spent most of the day shoveling the LaSalle back to Route 23. The storm was over but we would be snowbound for several days. I'm sure everyone who remembers this time has a story to tell. My friend, Rev. Kermit Moore, Pastor of Hamilton Chapel Church recently told me he had gone courting his future wife during the time of the big snow. He gave his car keys to her little brother, the proverbial unnecessary nuisance in those circumstances, to retrieve some article from the car. As the little fellow went traipsing through the snow, twirling the keys on his finger, they suddenly flew away and landed somewhere in the snowbound premises. Kermit said he spent a week there before the keys were found! My uncle, George Haddon, was a forest warden in 1942. He was very proud of the sign near his house, with the 4x4 support timbers proclaiming the fact. After the great snow had settled somewhat, he struggled out to the sign and, with his pocket knife, carved a notch to mark the depth of the snow. For years all in the neighborhood would stop and marvel at how high the mark was from the ground. Someone stood a yardstick by it, and it failed to reach the mark! Conclusion of wonderful Narrative by Leonard Sowards. May God bless his wife Mavis, and all their family. Leonard will be greatly missed by everyone lucky enough to have known him in this world, which he did make a better place!